Anita Baker is a retired American singer-songwriter. Starting her career in the late 1970’s with the funk band Chapter 8, Baker released her first solo album, The Songstress, in 1983. In 1986, she rose to stardom following the release of her platinum-selling second album, Rapture, which included the Grammy-winning single “Sweet Love”. 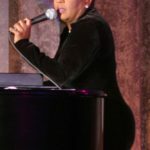 She is regarded as one of the most popular singers of soulful romantic ballads during the height of the quiet storm period of contemporary R&B in the 1980’s. As of 2017, Baker has won eight Grammy Awards and has five platinum albums and one gold album to her credit. Baker’s vocal range is contralto. "You leave home to seek your fortune and, when you get it, you go home and share it with your family." "We don’t do drugs, drink or use profanity. Instead we instill morals and values in my boys by raising them with a love of God and a love and respect for themselves and all people. I believe they will have a chance." "Completeness? Happiness? These words don’t come close to describing my emotions. There truly is nothing I can say to capture what motherhood means to me, particularly given my medical history."